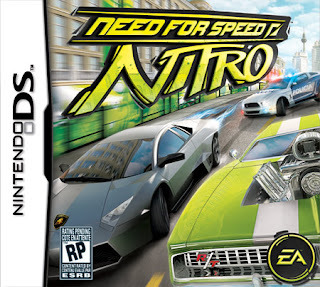 Need for Speed Nitro NDS apk android for DraStic free download working on mobile and pc,Nintendo DS Emulator Boasting a wholly unique look and feel, Need for Speed Nitro thrusts gamers into an exciting flurry of over-the-top fun, where each race track features big air jumps, smackable objects, shortcuts and more! 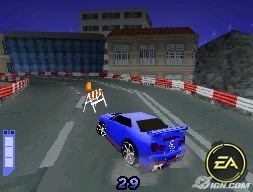 Battle through the mayhem of aggressive cops, take corners at 150 mph, and own the competition on extreme tracks. 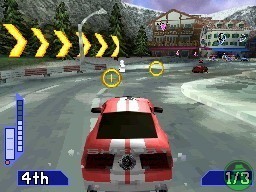 In the heat of adrenaline-pumping competition, gamers must take risks on the road to build up Nitro boost and use it at the right moment to leave their rivals in the dust. They must also be ready to escape relentless cops with a propensity for road blocks. Players who activate their Heroic Driving moves at the perfect time can pull off over the top evasive tricks, outsmarting determined law enforcement in the process. Not only do you have access to an impressive list of licensed cars, but you can also attach a graphic to your ride that will overtake the world when triggers are activated, vibrantly telling the story of their racing dominance. 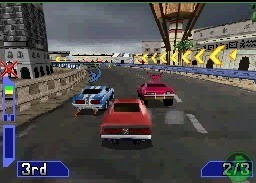 You can also decide how you want to one-up your rivals by picking from a fresh and exciting batch of game modes that feature everything from traditional circuit races to new, over-the-top modes like Smack’m’all.Ten Game Modes: Showcase racing prowess in a variety of fresh and exciting race modes including, Elimination (last place driver is eliminated at the end of every lap), Circuit (complete 3 laps, first one wins), Smack’m’all (smash objects in a limited time), Tag the World (achieve 100% tagging score in shortest amount of time) and many more! Extreme Tracks— From the streets to the off-road to unexpected places like a rollercoaster, each track will feature big air jumps, smackable objects, shortcuts and more. Battle to the Finish Line — Whatever the position in the race, players can still build up their nitro boost and use it at the perfect moment to take the lead. However, they can also be taken out by the cops at any time. Anything can happen right to the very last second. Heroic Driving – Use the Nitro meter to dodge the cops or overtake rivals by triggering spectacular Heroic Driving Moves like jumping over cars or driving on two wheels. Pick and Personalize Rides — Choose from over 30 licensed cars, ranging from modern to classic to exotics to tuner. Then customize them with pre-set colors and images. Tag the World — Attach a graphic style to each car and rely on racing finesse to hit triggers scattered on the road. Once activated, the world will be marked with the unique graphic style, loudly proclaiming racing excellence. Nitro-Charged Multiplayer— With WiFi, up to four players can take part in intense races, battling it out for victory. Even if they don’t own the game, several tracks, cars and game modes can still be shared. World Tour Campaign — Take part in street races across six cities throughout the world, including Cairo and Dubai, to unlock new cars, tracks and challenges.